Last time we saw Abbie and Ichabod in the season 1 finale of Sleepy Hollow one was in a giant pink plastic house in purgatory and the other bond by tree roots buried six feet under. As the new artwork shows for the forthcoming second season there are evil forces at play trying to keep them apart. The new promo and clip show that Abbie and Ichabod will be reunited despite their current perilous positions; the task at hand requires them saving Katrina once again as she was taken by former fiance Abraham and now Headless Horseman. Ichabod must also continue to get to grips with the modern world and he is not a fan of banks and/or credit cards. Some snark is also reserved for how little a bank trusts its customers with their pens. Oh I have missed you and your view of modernity, Ichabod. A slightly fancy fist bump to add even more confusion, general Ichabod/Abbie banter, John Noble’s sinister laugh and all the other evil they are facing makes Sleepy Hollow one of TV Ate My Wardrobe’s most anticipated fall shows. 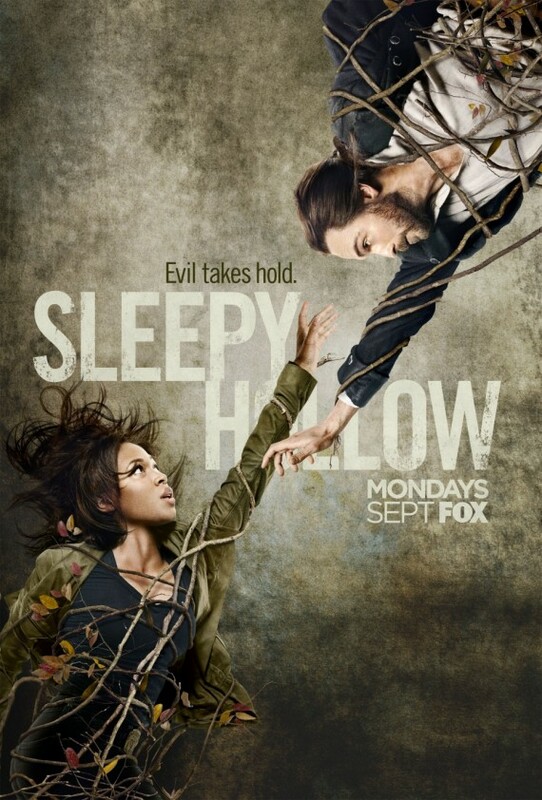 Sleepy Hollow returns Monday, September 22. It happened! 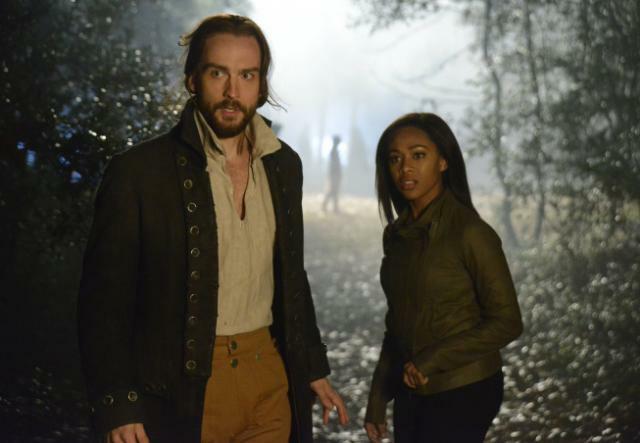 The Sleepy Hollow 21st-century makeover scene has occurred and it involves skinny jeans. In the Best of 2013 series I wrote about why Ichabod’s revolutionary styling was so integral to his character and “Vessel” gave a glimpse of Ichabod in modern dress while reinforcing his desire to hold onto the clothes of his past. 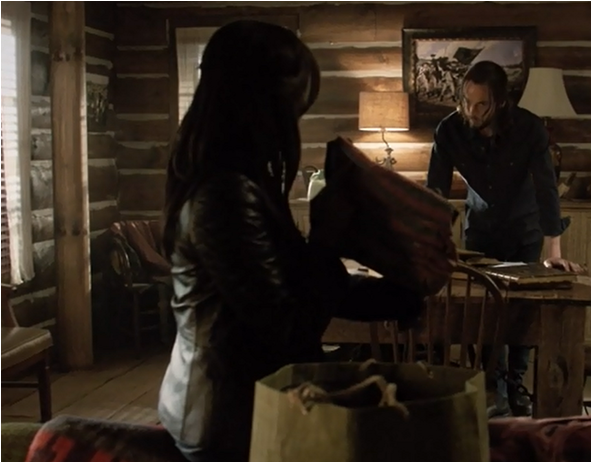 Ichabod doesn’t understand Abbie’s obsession with his finery, nor is he too happy with her choice of pants “One sign of the impending apocalypse is surely skinny jeans” – on that note I totally feel you Ichabod. Playing a scene like this with Abbie and Ichabod’s natural sounding banter while addressing audience questions is the right level of winking acknowledgement and it means we finally get to see what Ichabod looks like in modern dress. In terms of color and style it’s very similar to what he already wears, everything is just a little tighter. The navy button down might not be too much of a stretch and while I would love to see him in the stripy sweater Abbie is holding, it is a step too far and Ichabod reverts back to his regular threads. Now this has been dealt with, the only other clothing matter is how clean they are and the suggestion of dry cleaning is offered, even if Ichabod doesn’t know what that is. This should be the end of the nitpicks surrounding Ichabod’s wardrobe and the playful nature of this scene while also discussing the threat at hand is part of the Sleepy Hollow charm. If nothing else there will always be gifs of that one time Ichabod Crane wore skinny jeans.